When the Pavilions were designed at Disney World's Epcot World Showcase they sought to create a way to bring the history and feel of the country to life. When creating the Norway pavilion, the center piece is the recreation of the Stave Church, shown in the picture above. The Stave Church came to the forefront of Norwegian architecture between the years 1100 and 1200 AD. These wooden structures were built upon a stone foundation so that the wooden posts would never come in contact with the ground and therefore not rot. This architectural breakthrough has allowed the structures to endure over 800 years. Although there were over 1,000 stave churches in Norway at one time, there are only 28 remaining that were built after 1100. 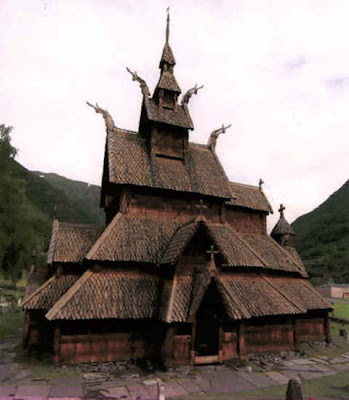 One of the most well known is the Stave Church at Borgund. This church was built in 1180 and was one of the largest and most complicated examples of the stave church architecture. If you compare the initial picture of the Epcot Stave Church with the one shown here of the Borgund Stave Church you can see many similarities. This picture shows a cut away view of the Borgund Stave Church so that you can see some of the construction features. The hallmark of the stave church is the 4 giant main posts that rise vertically from the foundation. 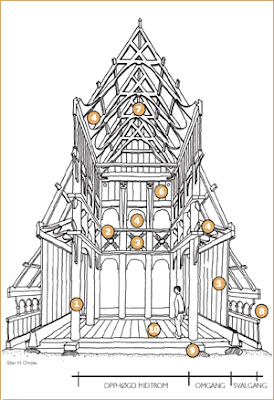 A stave church can consist of over 2,000 pieces to create the intricate system of posts and beams. In addition to the framework, a stave church is characterized by the intricate carvings that are seen throughout the structure. The Epcot version certainly does a good job of representing this truly Norwegian form of architecture. The Disney Imagineers have gone to great lengths to really create a pavilion that captures the heritage of Norway by erecting this excellent reproduction of a stave church. The next time your are visiting Epcot and walking through the Norway pavilion take the time to check out the stave church and marvel in the architecture that allowed these wooden structures to endure over 800 years. 0 comments to "Explore Norway's History at Epcot's Stave Church"